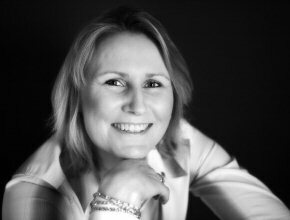 For those of you visiting for the first time and wanting to find out more about me and my career in darts, I am the ten-time winner of the Women's World Darts Championship, the former captain of the England international ladies' darts team and I have won over 300 singles and doubles dart titles worldwide. There is plenty here for you to discover. If you are interested in booking me for an exhibition or personal appearance then booking could not be easier. Simply check out my exhibition and personal appearance booking form link below or directly from here. To read more about promotional exhibitions please see TEG Promotions section. My unprecedented success in women's darts over the years could not have been achieved without the support of my sponsors. As you browse through the site you will see how important it is to have sponsors on-board helping me to achieve my goals. I have a great team behind me and that fills me with confidence. Thanks also to my many fans, my family and my friends who have continued to encourage me over the years through the best and worst of times. 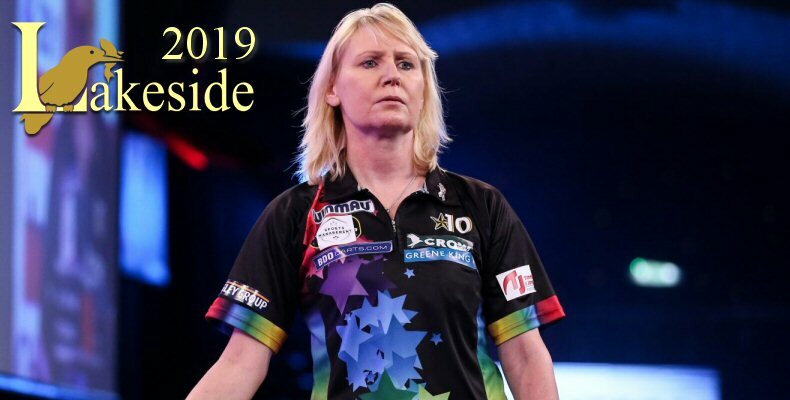 Rest assured that I will continue to do my best to represent women's darts across the globe in the months and years to come - and of course to win many more trophies. My MBE investiture took place on Friday 24th January 2014 at Buckingham Palace. The original scheduled date, 3rd October 2013, was postponed because it coincided with the Darts World Cup in Canada, an event that takes place once every two years. I captained England to a successful World Cup Victory. I hope you enjoy the new web site. Your feedback is always welcome. News and the News Archive. Trina Gulliver MBE earned her 71st England International cap playing for England in the British Internationals 2019. Tina has won on 61 occasions to date. England ladies were crowned British International Champions 2019 for the 30th time in the tournament history. 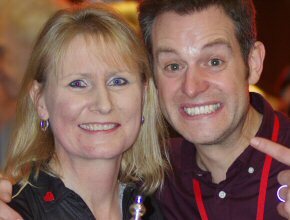 Trina made her 19th consecutive appearance at the Lakeside World Darts Championships this year. After a tough first round match and sudden leg decider Trina managed to overcome the challenge form Karolina Podgorska. Unfortunately, a few missed doubles meant Trina lost in the quarter finals to Lorraine Winstanley who eventually made the final losing out to the Japanese new comer and soft-tip superstar Mikuru Suzuki. Trina has competed in all 19 World Championships. Trina Gulliver and Paula Jacklin, are the 2018 Antwerp pairs champions. 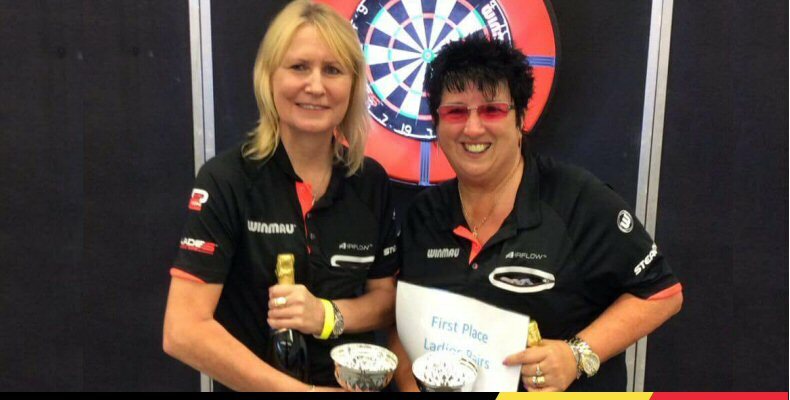 Trina Gulliver and Paula Jacklin won the Antwerp Open ladies pairs championship at the weekend. The two ladies have become a force in the ladies’ pairs with each playing to each other’s strengths. The ladies also competed in the women’s singles on Sunday. Trina also got to the semi-final, however, lost Tricia Wright 5-2. Paula made the quarterfinals of the singles losing to the eventual winner of the tournament 4-0 Casey Gallagher. Titles like no other ladies dart player….. The most successful ladies darts player ever. Here are just some of Trina’s achievements. Over a three hundred singles and doubles dart championship titles Worldwide. Some of Trina’s vast collections of photographs taken while playing darts, still shots, her investiture and wedding to Sue. 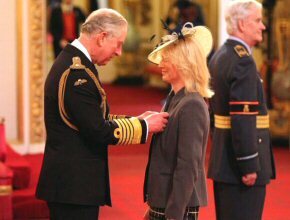 Trina was awarded the MBE in recognition of ‘Services to Darts and Charitable Fundraising’. Partners in life and Partners on the oche, Trina and Sue. Trina Gulliver is the most successful ladies darts player ever. She has over three hundred singles and doubles dart championship titles to her name and is champion for ladies darts. Sponsoring Trina will give your company / business exposure more than any other female dart player. 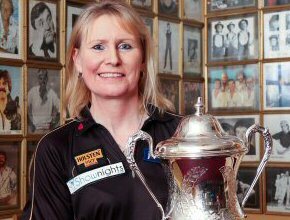 The ten time ladies darts player has been credited with numerous awards and honours including the MBE and BBC Midlands Sports Personality of the year. For more details of how you can be part of the team click on the link below. Q. Have a question or need a booking quote? You can contact Trina direct. The easiest way is to use the contact form on this website. For booking enquires click here or for general in enquiries click here.